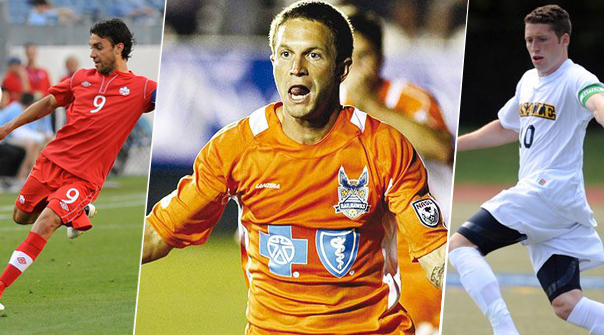 A year ago, after the 2013 MLS SuperDraft, I published two articles: my Top 10 USL Pro and Top 10 NASL prospects. In analytics/scouting work I actually do these lists when the season is in progress, but last year I wrote the articles at this time of the year as I was worried about the Canadian MLS teams' depth going into the 2013 season and thought these players could help. Shortly after, Toronto FC had just signed Gale Agbossoumonde, and Vancouver signed Corey Hertzog. Meanwhile, most of the players I listed remain playing in either USL Pro or NASL in 2013, including my number one prospect in USL Pro Kevin Molino, who was recently signed by Orlando as their first ever MLS signing. I also talked about the advantage of MLS clubs loaning younger players and where I see American soccer going. One idea being that leagues such as USL Pro not being a lower league to MLS, but a minor league, and with the LA Galaxy II in USL Pro, this season this is becoming more of a reality. I'm still not convinced if MLS are willing to use this for their advantage or is it just for show to compensate for the failed idea of a reserve league, which was another idea I predicted was never going to happen. My main concern is that I know there are players competing in North America who are better than certain MLS players, yet are continuously being ignored. With this year’s list I've decided to include the top 20 players in my analysis who have been missed by MLS and include players who have been completely overlooked. Even though some might have been drafted, none played any MLS games. Furthermore, all of these players are 26 years of age or under and had successful 2013 campaigns, but despite this upside still none have been even offered a MLS trial this off-season. The disappointing thing in terms of trying to improve the quality of the league is that I have had the ear of people involved in the MLS who have dismissed this type of analysis. Even in the case of Kevin Molino, if it wasn't for Orlando gaining an MLS franchise, Molino would probably have been ignored by all other MLS clubs since the people I spoke with no one knew who he was. The one good thing about making this list available is the public gains a greater awareness of the issue and hopefully over time it can be taken advantage of. Here is my list of the top 20 prospects playing soccer in North America who should be offered an opportunity with a MLS club. Daniel Barrera is a 24 year old Colombian-born midfielder with American citizenship. Despite playing for the United States 2007 Pan American Games side, and trials with Derby County and playing professionally in Serbia, he has never been offered a tryout from an MLS club. After playing 2012 with Cal FC, Eric Wynalda brought him to the NASL Atlanta Silverbacks. Berrera quarterbacked the Silverbacks offense tallying four goals and seven assists from an attacking midfield positions and was responsible for set plays that lead to a direct free kick goal and two dead ball assists. After not getting offers from the MLS, Barrera will join San Antonio for the 2014 MLS season. Jose Cuevas was listed in my top USL Pro prospects last season after leading his club Charleston Battery to the 2012 USL Pro Championship and winning Rookie of the Year. Despite this success, and being American, Cuevas was not given an MLS trial and instead rejoined the Battery in 2013. Charleston had a solid 2013 season finishing 3rd during the regular season with Cuevas being a key player in the midfield scoring four goals and three assists. He has the ability to play both centrally or on the wings. Cuevas is not under contract and could join any club on a free transfer. Gibson was also in my top USL Pro prospects last season and over the past two seasons has lead Dayton to two respectable seasons after being the laughing stock of the league prior. He’s compiled 14 goals, seven assists and 56 shots on target in 43 games over the last two seasons playing upfront for the Dutch Lions. I feel at the MLS level his speed would make him a very useful winger who could also provide offense. Bardsley played college for a smaller school, although you assume after two successful seasons at USL Pro he would get a chance from a MLS club. Mark Anderson was my top prospect in the NASL during the 2012 season as the British native showed the same success he had in college by scoring exceptional goals, especially from distance. Anderson had some issues with injuries in 2013, playing only 12 games but scored 2 goals from distance including a direct free kick, and had 11 shots on target. Still 24 years of age, Anderson grew up in the Sunderland academy and has comparison with Scottish EPL player Charlie Adam for an ability to create offense from the wing, midfield or as a secondary striker. Diaz is a lot different than other players on my list and demonstrates the impact international scouting can have on a team and the role New York Cosmos could play on North American soccer. Diaz is on my list because he's 23, and despite being only 5'7, played professionally in his home country of Venezuela and has great skills on the ball. I think a greater example of the Cosmos influence is that Marcos Senna played for them in 2013 and the recent story surrounding Whitecaps draftee Andre Lewis. I believe a pro team can compete and do a better job at finding and developing talent than MLS, which is hampered by a single entity and salary cap. The 23 year old defender/midfielder has had a cup of coffee with MLS clubs after being drafted in the supplementary round by Chivas USA and looked at by Seattle, but was never given a chance to play. It’s an interesting comparison with Steve Birnbuam, who was drafted 2nd overall by DC United mostly due to his goal scoring ability as a defender, that no MLS team have given Steres a look this winter. Steres scored seven goals with Wilmington including 4 from headers and also had 3 assists. Steres does lack athleticism to be a star but his versatility could make him useful for a MLS club. After three successful seasons, in terms of individual performance with FC Edmonton, Saiko has decided to continue his NASL career in 2014 with San Antonio. After the success of fellow Canadian Jonathan Osorio in MLS, it’s surprising that Saiko hasn't been given at least an MLS trial. Saiko played with the Middlesbrough academy in England before joining FC Edmonton where he scored 18 goals, 14 assists and 71 shots on target in 65 games. Out of the Canadian National Team picture as well, Saiko is still only 24 and could make an impact both for club and country if given the right opportunities. In many ways, MLS clubs and the league can be quite perplexing and the fact that Dane Kelly has not been given an MLS trial adds to this. After a draft dominated by Jamaicans, fellow countryman Kelly was in the top four in scoring with 11 goals during the 2013 USL Pro season, but has not received any interest from MLS clubs. Kelly is also the only traditional target man in my prospect list who uses speed and athleticism to score goals, including 3 headers in 2013. The 22 year old Kelly now has 21 career goals in USL Pro while still on loan from his Jamacian club Tivoli Gardens. Mendes is another player who Eric Wynalda brought to the NASL from Cal FC and lead the Atlanta Silverbacks in goals with eight. The 23 year old Brazilian is 6 feet tall, but plays more deeper than most strikers so he could play in the midfield if asked. Mendes has been based in the United States since 2009 and played in American College, USAAA and scored three goals in only two games on trial with Rhode Island in the NPSL. Mendes has joined Indy for the 2014 season, but with all the hype surrounding Maximiliano Urruti the past season, Mendes is a player with a similar skill set and would bring the MLS a greater profit on investment. Like many players, including most recently Andy Lubahn and Juan Castillo from the 2014 MLS draft, Brian Shriver is an example where injury or circumstances meant he got lost in the MLS draft hype versus overall player development/awareness. Unfortunately, despite having a successful career in the NASL, including leading goal scorer and eight game winners in 2013, he’s still a forgotten man. Shriver was a highly touted college player with UNC, although was injured before the draft in 2009. He was drafted by FC Dallas, but not signed, and so he joined Miami FC in USL Pro and now has 30 goals in lower American soccer leagues despite still only 26 years of age. Brock Granger was on my MLS draft radar in college while at Louisville and played with MLS starlets Nick DeLeon and Andrew Ferrell. He also had success in the PDL and there was talk he might even join the Portland Timbers as a Homegrown player. Instead, he was only picked in the Supplemental Draft, didn't sign and instead joined the Dayton Dutch Lions in USL Pro. Granger is your typical American full back: smaller but in the same mold of 2013 draftee and GA Eric Miller, but in terms of salary a fifth of the cost and now has professional experience. Of all the players in my 2013 NASL/USL pro prospects, the only true disappointment might have been Walter Restrepo. Others might have had less of an impact in 2013, but it was part of an MLS club (Hertzog/Agbossemonde for example), while Restrepo returned to the NASL in 2013. In his defense, Restrepo was returning from an ACL injury and he was more effective towards the end of the season, being a greater offensive threat especially with Mark Anderson in the line-up and Walter on the right. The 25 year old has joined San Antonio in 2014 in a bizarre story where Fort Lauderdale traded Restrepo for club expenses during their away match to San Antonio later this season. The Rochester Rhinos struggled in 2013 partly due to right midfielder JC Banks missing some games through injuries. Banks was in my top 10 USL Pro prospects last season and what I like most about him is his ability to fit a role. You can argue that MLS and all of American soccer struggles tactically, although JC plays the touchline at a high soccer IQ level, allowing his club to utilize a traditional four man midfield. Although only 24, I think there is a concern he might be reaching his peak since speed plays a major role in his game. Ben Newnam was a defensive presence throughout the 2013 USL Pro campaign leading his Charlotte Eagles all the way to the conference finals until they were humbled by USL Pro champions Orlando 7-4. The 22 year old fullback had a steady college career at Wake Forest playing 74 career games, which started out as a midfielder but was moved to full back based on his ability to cover the wing. Not blessed with size at 5'9/160, Newnam does have an engine which allowed him to be in the top 10 in terms of minutes played last season. Jacob Bushue was my highest rated player for the 2014 draft who wasn't drafted, despite what is widely regarded as a weak position in the MLS. Bushue was penalized for being versatile and playing multiple positions, however, as an MLS player I see him at right fullback. Bushue signed for NASL expansion club Indy, and in the NASL he might be given a chance to improve his offensive potential as well. I also wouldn't be surprised after a few games in the NASL, like Mark Bloom did last season with Atlanta, Jacob could join a MLS club in 2014 or 2015. A proven goal scorer throughout his career in the United States, Lucky Mkosana actually made a move during last season between levels, although not to MLS but from USL Pro to the NASL instead. Despite his name, Lucky might argue the opposite: he scored 34 goals in college earning a number of records in the Ivy league. He then scored 20 goals in two seasons at Harrisburg in the USL Pro before joining Tampa Bay, scoring for them as well, but hasn't been given an MLS trial. On the flipside, fellow countryman Schillo Tshunma scores six goals in college last season as a forward and gets a GA contract. When Ottawa was granted an NASL franchise, the first thing that came to my mind was finally Carl Haworth will be given the platform he deserves to prove his value. I've been a strong supporter of Carl since his college days in Niagara, giving his profile to scouts I know throughout the football world. Like Montreal draft pick Pete Caringi, despite size and athleticism issues, Carl has performed at every opportunity he been given. And also like Caringi, Haworth had a very strong 2013 PDL season scoring 12 goals and adding 12 assists in 12 games, greatly outperforming many players with a greater pedigree. This is the third ex-CAL FC and Atlanta Silverbacks player in my list, which shows how much lost talent there is in the American system and how well players can make a jump despite myths regarding quality of league. Menjivar is 23 years old, American born, but plays for the El Salvador national team and already has 10 caps. Menjavar is on the small side and depends on his skills with the ball at his feet. Menjivar will also be joining San Antonio, which might give the Scorpians an MLS quality midfield, especially in terms of potential and should be fun to watch. During his college career at UC Irvine, Miguel Ibarra’s performances and accolades made him a prospect going into the 2012 draft. After further analysis, I did have some concerns and still do, as Ibarra is small at 5'7 and much of his offense comes from delivering free kicks, but he has impressed me with the impact he has made with Minnesota. Ibarra has played 49 games scoring 4 goals and 8 assists in the NASL, has adapted well with the travel and physical play of the pro game, and hopefully is an example of how lower league experience can help in player evaluation. Another player ranked in my 2014 draft prospect list who wasn't drafted and like Haworth, Plumhoff has performed whenever asked, both in college and PDL. A similar style to highly rated draft pick Steve Neumann, who Jason got to play with in the PDL at Reading United, with Plumhoff having better stats than Neumann. Each year there are about 300 college players, many with talent, that never get a chance at a pro career because of lack of awareness/scouting by all pro American leagues. Plumhoff has yet to sign with a club in 2014 and it would be disappointing if he becomes one who isn't given an opportunity.